The title of this blog post is taken from an observation made by my friend Mike Zeller, who lives in Colorado, United States. Mike is helping me locate a few used hand tools, which I might someday manage to ship to India. I have been telling him about how I don't have too much money these days to throw around at expensive tools and how great it would be if he could find me something cheap and in decent working condition. Many Indians would be surprised to know that there are more excellent old tools in use in Western countries than here. Out here we don't have a tradition of collecting tools at home and even if we do, we dispose them off to the Kabariwalla once they are old and rusted. In the West, on the other hand, old tools, especially hand tools, are often handed down over the years or sold to another generation. There are literally thousands of old woodworking tools, including thousands of excellent Stanley Bailey style planes, still circulating there. Some of these tools command high prices because of their vintage value; sometimes you can get them for a song. Every now and then someone there stumbles upon a cache of rusted old tools left behind by a long-departed soul, and passes them on. People get lucky and can chance upon a fine tool that hasn't been touched by a working hand for decades. It is very satisfying to know that many old but superbly crafted hand tools can and have lasted for a century and more; they have a life beyond ours! Mike and I have been discussing various woodworking issues over email in recent weeks and he once remarked: "I think we are both on a budget of a certain amount, which for me is good because it forces me to be extremely creative about solving problems and doing much work myself." His comment made me reflect on how my views on tools have changed over the years. Several years ago, when I closed down my consultancy, I got a lumpsum payment, a lot of which I spent on woodworking tools, mainly power tools because at that time I thought power tools were the way to go. Many of those tools today are lying unused. These days I look at online stores selling power tools of all kinds and feel amused; if this was a few years ago I would be thinking how to get hold of some of them. Today, it seems such a waste to buy tools worth thousands of rupees that will become obsolete in a few years and newer better models will be out to entice buyers. It is an endless process that consumes consumers. So much better to buy hand tools preferably old ones that will last a lifetime and do the job often better than all those shiny, expensive power tools. I feel it is better to have fewer tools, only the ones really needed for the job and most of all to take good care of what one has. Tuning, oiling and sharpening included. 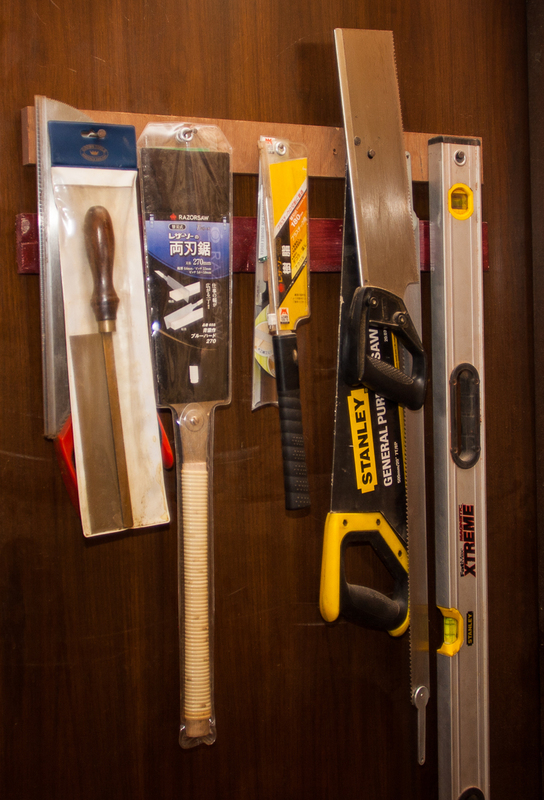 A few really sharp well-tuned hand saws, planes and chisels can get almost everything done. A tight budget also serves to accentuate the worth of what one has, instead of the perpetual round of wondering if one has missed out on the latest tool, the latest deal and so on. Nowadays, I mostly concentrate on building things rather than on tools themselves. The process is getting more and more interesting as I find myself gradually but steadily getting sucked into it. This week, I spent most of an entire day cutting hinge mortises and adjusting the fit of the doors for my plywood tools cabinet. It took time but was good time spent listening to some old '30s and '40s Jazz and chiselling away. The hinges took time to fix and required adjustments to get the doors to hang right with about the right amount of reveal and so on. The cabinet is finally ready and mounted on the wall. The door knobs have been attached and a chisel racks added. I have applied a couple of coats of Shellac but need to sand it down, apply another 3/4 coats and then rub it down to knock off the shiny parts to get a nice even tone. 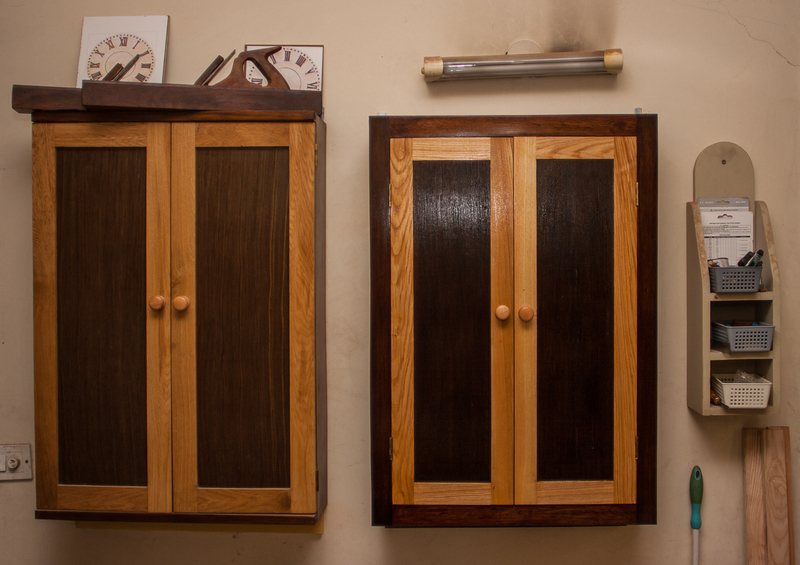 This cabinet is bound to make a difference to my working, since till now my chisels were in boxes and a hassle to get out every time when I want to do something. 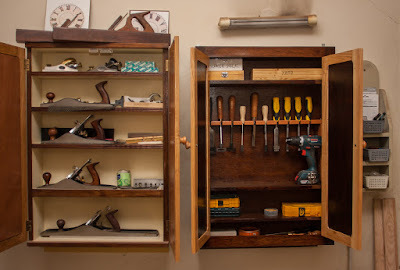 I have a similar cabinet for my most used hand planes and having them at arm's reach speeds up things a lot. Ninety per cent of my hand tools now fit into two wall cabinets, one small cabinet with drawers and a sideboard while the saws hang on the door. Everything is at hand, ready to go. But hey, there's always room for a few more tools! Most of my saws hang on a door, ready when I need them! Guys amazing article this is very much help full for all diyer starters... I personally get my power tools and other materials rented on www.outilz.in so I wud refer this to all my mates. 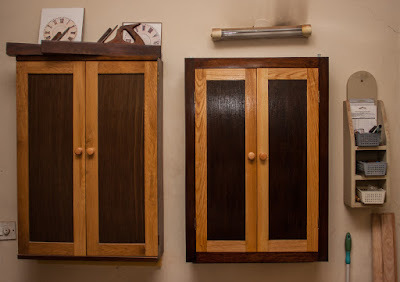 What wood has been used for the cabinet?